What is it like to live every day with an ever-present risk of disaster? 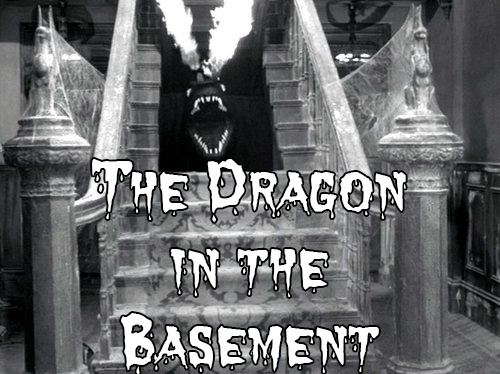 Eddie Munster’s pet dragon, Spot comes to mind. Needless to say, any time Spot wanted to eat, he was fed. The idea of having such a destructive force in your midst is ludicrous, right? Then why do plumbing designers place large RPZ backflow preventers in mechanical rooms? In the 60s, the only backflow prevention assemblies (BPAs) that were around were the single-check, dual check, and double check valve assemblies. None of these solutions brought a risk of indoor flooding because they were closed systems with no capability to dump the water flowing through them. Eventually, when inferior workmanship, age, and free flowing debris caused these valves to inevitably fail, no one knew it. Ironically, the same reason they were not an indoor flood risk was the very reason they were an unreliable solution for stopping the flow of returning water: there was no way to detect when they had stopped working. Then the RPZ was born. 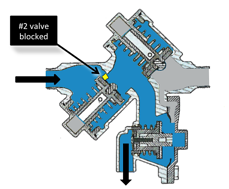 Now, because of a reduced pressure zone between the two check valves and a hydraulically operated differential relief valve designed to open when a valve failure occurs, there is no real need to know when the check valves fail. When they do, the RPZ dumps every ounce of water being channeled through it through the relief valve. Finally, a fail-safe solution existed that protected the public water system from any return of used water. But it came at a huge cost. Clearly, manufacturers knew what they had created. Whether they alerted designers properly regarding the new risks or not is a fair and continuing question. It’s true that from the beginning, they have published ominous “relief valve discharge rate” charts for all their products and as of today, that written notice has proven adequate to cover their backsides from casualty loss liability. However, evidence of a lack of communication between the manufacturer and the designer is overwhelming. This is best displayed by two facts: the continuing practice of placing these assemblies inside; and the utter absence of knowledge of any expanded risk among plumbing engineers. Download the free guide to Trends in Backflow Preventer Valve Selection and Location to learn more. Blame might well be debated for ages to come, but for designers it is time to bring clarity to this issue so that indoor floods caused by discharging RPZs – events that are steadily on the rise – are eradicated not only for the benefit of lives and property, but for the professional liability of designers as well. In order to understand the flood risks of the RPZ, let’s take a look at its design and the various valve failure combinations that would cause a casualty loss. 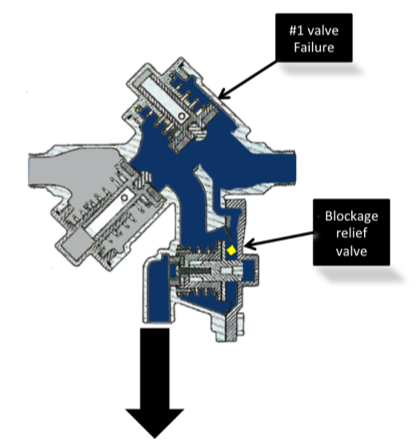 First, consider a failure or blockage of the number #2 check valve, one that might naturally occur at the end of the day. You can see that a small pebble has lodged there as in the first image. Now let’s say there’s a fire around the corner that causes back siphon at this point in the system as in the image to the right. Because the # 2 check valve is not closing, all the water that has been delivered to the building will continue to flow out the relief valve until the private lines are cleared. If this is a large, or multi-story building, that’s a lot of water. the flow is relatively short-lived. 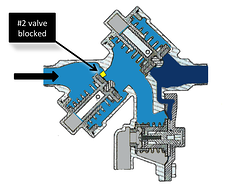 Once the delivered water clears the relief valve, the flood ceases. 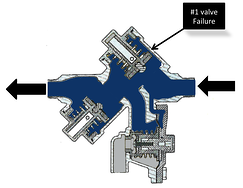 Now consider a failure or blockage of the #1 check valve as shown on the right. Under constant demand situations, and without backflow or back-syphon, this is an undetectable event. Water merely continues to be delivered as required regardless of the failed valve. Water flow will stop eventually, even if only for a few moments. When this happens the relief valve will tend to bounce open and closed due to the lost control of the #1 check valve. As the relief valve bounces some water will flow through it. And while it is a nuisance, it is not catastrophic. This scenario continues because the erratic behavior of the relief valve elevates the probability of a truly catastrophic event. It is quite common for small amounts of debris such as solder, flux, or lime deposits to be found flowing in the main pipes, especially after maintenance or repair work. When this debris hits the relief valve it can lodge there rendering it unable to close as in the image to the right. A very small particle stuck in the right place is all it takes. Assuming that demand has restarted within the building, the user will continue to receive water - albeit at diminished pressures because some of the water is now flowing directly into the relief valve and is being dumped at the backflow assembly’s feet, wherever that might be. Finally, when demand finally stops completely, all the water being delivered to the property will now flow directly out the relief valve unabated until the water supply at the meter is turned off as in the final image. 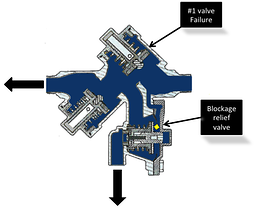 This is the event you must design for: failure or blockage of #1 plus an inhibited (blocked) relief valve. Next time we’ll discuss exactly how fast a flood will happen, even with conventional drain systems in the mechanical room floor.